Hannah Graham of Bowdoin College, pictured during a game last season, helped the top-ranked Polar Bears beat Husson University on Tuesday night. Bowdoin College didn’t waste any time Tuesday night showing why it is the nation’s top-ranked team in NCAA Division III. The Brunswick-based Polars Bears of Adrienne Shibles scored the game’s first nine points and never looked back, coasting to an 86-48 victory over outmanned Husson University at Newman Gym. Bowdoin, NCAA Division III runner-up last year, improved to 13-0 while Husson fell to 7-6. The taller, deeper and more athletic Polar Bears dominated every facet of the game against the Eagles, who turned in a gritty, hardworking performance but were simply no match for the visitors. Bowdoin played smothering defense, attacked the boards and did an impressive job moving the ball and then getting it to the open player against Husson’s zones. The Polar Bears created a fast tempo that made the Eagles uncomfortable and forced 20 turnovers. 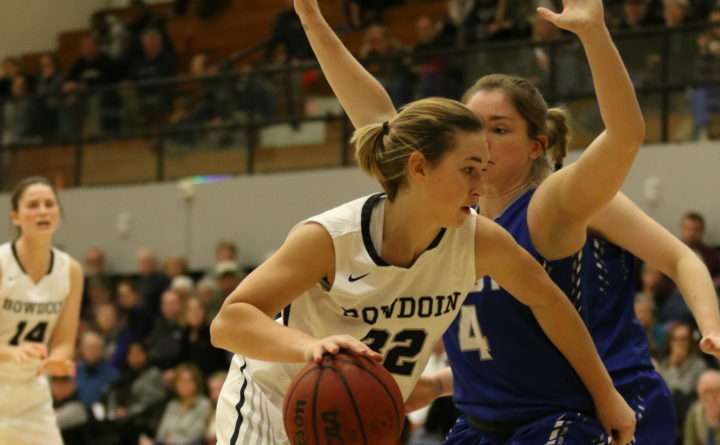 Senior guard Taylor Choate led Bowdoin with 15 points and six assists along with three steals and four rebounds. Annie Boasberg posted 14 points and five rebounds, Abby Kelly scored 13 points and had five rebounds and two assists and Sela Kay scored 10 points. Presque Isle senior Hannah Graham contributed seven points, six rebounds and four assists, Annie Maher had seven points and seven rebounds, and South Portland’s Maddie Hasson had four points, three steals and three assists. Bangor’s Cordelia Stewart registered four points and four rebounds, and Samantha Roy recorded six points, three assists and two steals. All 11 Polar Bears who played registered at least one point and a rebound and nine had at least one assist. Bowdoin outrebounded Husson 51-31, including a 21-7 edge on the offensive glass. Husson leading scorer Kenzie Worcester, who always had someone in her face, produced a team-high 13 points along with three rebounds. Vanessa Duarte had nine points and two steals off the bench and Sydney Allen had five points. Husson coach Kissy Walker was looking for a higher compete level from her team than it showed in the 94-32 loss to Bowdoin in the first round of the NCAA Division III Tournament last year and she felt she got it. “We competed but, at times, we just couldn’t compete with their size and strength. They were bigger, stronger and quicker than us. They’re very good. You have to play quicker and harder against them and make ball fakes,” Walker said. Hasson said the Polar Bears take great pride in their team defense and spend a lot time working on it. Bowdoin limited Husson to 35.2 percent shooting from the floor. Bowdoin shot 41.9 percent including 41.2 percent from beyond the three-point arc as the Polar Bears nailed 14 three-pointers in 34 attempts. “They’re really solid one through however many they have on their roster,” Worcester said. Bowdoin built a 48-25 halftime lead behind Kelly and Choate, who had 13 and 11 points, respectively. Graham came off the bench to contribute seven points in 11 minutes and Boasberg contributed five points and four points in 12 minutes. Hasson, the U.S. Basketball Writers Association Division III National Player of the Week, chipped in with four rebounds and three steals over the first 20 minutes. Husson was without three players sidelined by knee injuries, including starting 6-foot sophomore center Sami Ireland, Husson’s top rebounder and second-leading scorer. Husson will entertain rival Maine Maritime Academy of Castine at 7:30 p.m. Friday in a battle of North Atlantic Conference unbeatens. Both are 4-0 in conference play.